Today is our 4th anniversary. That's right--we have a cool wedding date. Anyone get a free slurpee from 7/11 today? This is also a special few days here as I finally finish my bachelor's degree. I know you are all just as excited as me since you've been reading my whines for the last two years about going back to school. Many thanks go out to my parents for getting me through the first round of college, both financially and physically. I would never have gotten my nursing degree in the first place without them. Thanks to my brother who considered me a nurse from the time I first decided to be one and claimed the role of Dr. Crusher when we played Star Trek in the backyard and who takes every opportunity possible to tell people his sister is a nurse. Thanks to my nursing school professors, most importantly Mrs. Zipf, who likely barely remembers me, but of whom I fondly think of whenever I hear "Let it Be". Thanks to Tiffany for her patience in helping me with biochem, her prayers, and her willingness to help me discern my future with her gift of wisdom. Thanks to my Aunt Betty for her stellar recognition and remembrance of all my school assignments. Thanks to my friends and all of my other family who have, and I hope always will, come to me first with that weird rash on their leg or that irregularity of bowel. It's always my pleasure to diagnose you. Most importantly, this time around I have my husband to thank. It's been two years of his school followed by two years of mine. The difference being that while he received a stipend for his degree, he supported me through mine. He's read some really boring papers and listened to some very strange professors. He's had some incredibly boring weekends and some lousy dinners. And even though this has to do with being a nurse and not being in school, I think it's worth mentioning that he has spent Christmas Day completely alone. I remember hearing once how my aunt thanked my uncle at her graduation by letting loose a balloon with a streamer reading, "Thank you, Paul!" from underneath her graduation gown. Being able to do that was the only reason I considered walking at the actual graduation. It's been over 11 years of fun, 4 years of marriage, 6 different homes, 5 different states, 1 overseas move, and now 2 degrees. Thanks for the ride, HB. Congratulations! So exciting! And you're right that the card industry is missing a big opportunity here. I have seen ones for professors/teachers from graduates. Unfortunately, not all people are as grateful or selfless as you, so I don't know that many other people notice that gap in the market. Congratulations on your degree and you're fourth anniversary! 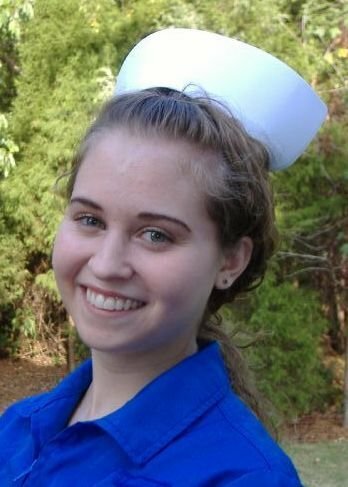 Congratulations on the well-deserved completion of your nursing degree! So glad we could be a small part of the process, especially the privilege and joy of raising your hubby.